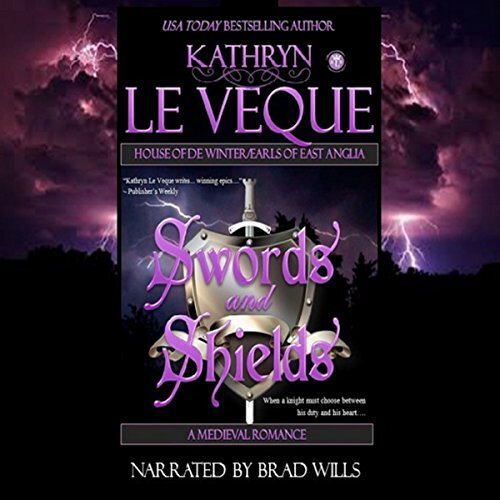 Audiobook Review: SWORDS AND SHIELDS by Kathryn Le Veque ~ a rich, story much like a bold, red wine! Hold your hearts close — there are moments of heart-searing pain! AD 1301. Following the great quest north with Cortez de Bretagne (The Questing), de Bretagne’s knight, Sir Drake de Winter, returns home to the great de Winter empire in Norfolk, but it is not the safe and wonderful haven he remembers. Family unrest causes him to flee to London and into the service of the elderly King Edward I, a personal friend of Drake’s father. In Edward’s service, Drake finds himself in Scotland as a major player in the Siege of Caerlaverock Castle. In a moment of pure luck, he saves the king from great injury, and in thanks Edward gifts Drake with an heiress for a wife. But it is not the happy circumstance most men would see it as. Drake, a confirmed bachelor, cannot refuse the gift of a wife and is therefore forced to wed Lady Elisaveta du Reims, daughter of the last earl of East Anglia. Beautiful and intelligent, Elisaveta is English by birth yet of Scots and French blood, making her very much an enemy of England during these turbulent times. Although Drake is polite to her, he does not trust her. He does not want her. He cannot resist the feelings she stirs within him, but his instincts tell him to beware. His instincts are correct; Elisaveta is not as she seems. Her heart belongs to France and to Scotland, but with the introduction of a new husband, her loyalties are torn. She, too, cannot resist the feelings the powerful young knight stirs within her. Join Drake and Elisaveta on this unforgettable and passionate adventure. My Thoughts: House of Winter has 200 years of loyalty to England. The family is one of honor. Le Veque’s world encompasses great knights of passion and honor fighting against great odds. Experience the heartache of choices made full of betrayal and the damage which possibly can’t be repaired in Swords and Shields. I’ve seen the sword, its name Laspada at work before, in a story titled the same. It was when Davis and Devereux met, Sir Drake’s parents. I listened to that book back in October, 2017. So it was with a thrill I saw the sword once again in action with Drake, Davis’ son. Drake, first-born of a set of twins, provides some very comical moments as he struggles to avoid the noose of being betrothed. But when the King gets involved in rewarding him with a feat of bravery saving his nephew, and sweetens the pot with a sizeable Earldom, he succumbs, but not willingly. He, as his father before, sends his sword to marry Lady Elisaveta du Reims, but she will have nothing to do with it. After the rocky marriage ceremony, which provided lots of laughter on my part, they rub along well together, and find they are well matched being quick of wit and humor. Lady Elisaveta marries into a family founded on love. One she hasn’t experienced. Her past is most austere, and is eventually used as a bride to help her grandmother, Ma Belle, revenge the death of her Scottish husband. Elisaveta understands the value of belonging to the de Winder family. Her dirty, little secret of having to spy on her husband, tortures her conscious, but with her wicked grandmother in control, she feels powerless to do anything but spy. So when she hears some information about the movements of King Edward, she shares it with her grandmother, hoping this will be the only time she has to do it. This sharing has terrible consequences — the core of the story. Narrator Brad Wills brings the scenes to vivid, brilliant color. His impersonation of the women have my mind’s eye see them as such. His voice captures the exquisite mean-ness and wickedness of Ma Belle. With scenes of panic or deep emotional tears, he not only has me witness the words, but I see the panic, sniffles and tears running down cheeks. Wills has a good eye to such detail, perfecting the telling as few narrators do for me. The quote: “You will breed a rebellion” cuts to the quick with me. Ma Belle sees her granddaughter as a pawn, one to birth an enemy within the de Winter’s. Through an act of love, her role is to produce the enemy — only to breed more hate. I adore the way Le Veque places me in Medieval times. Her stories are richly varied, which are potent in the meaning of life. This particular read will have a special place in my heart, for it touched my feelings to the core. 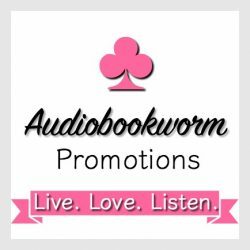 This entry was posted in Audiobook, Audiobook Review, Historical Romance, Medieval Romance and tagged Audiobook Review, Brad Wills, Historical Medieval Romance, Kathryn Le Veque, Swords and Shields. Bookmark the permalink.